(continued from page 7) and with the large number of sheds this yard presents the best of appearance of any in the city. Their stock is large and complete, comprising the best grades of lumber and all classes of building material. Anything that is needed in wooden constructions can be found at this yard and in such a variety that the purchasers cannot fail to make a judicious selection. They are also agents for the celebrated McAlester coal and Agatite cement plaster. Mr. 0. K. Nicoll is the manager of the yard and is making friends for the company with his courteous and business like manner. This firm probably carries on the hugest business in the city in any line, and certainly the largest in their line of trade. They are the pioneer cotton ginners of the city and have handled the major portion of the crop which has been marketed in Perry this year. 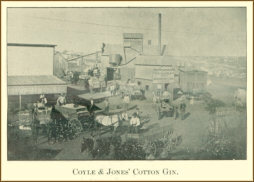 Their gin near the Santa Fe railroad between C and D streets is a complete plant, having been refitted with new machinery throughout during the summer. They also handle all kinds of grain and are constantly in the market to purchase the two great staples, wheat and cotton, from the farmers at the best market price. The personalle (sic) of the firm is composedof J. E. Coyle, Ed J. Coyle and D . B. Jones. These gentlemen operate a first-class livery and feed stable on Sixth street just north of the square. Their rigs are new and of the highest order. Good driving teams, good drivers and number one turnouts. Drives made to all of the inland towns and prices reasonable. Commercial trade a specialty. The best of facilities for boarding. Horses kept at this barn receives (sic) the closest attention of experienced horsemen. Persons needing anything in the line should patronize this barn. They extend a special invitation to farmers and the traveling public to stop with them. The church, the home and the Christian school together stand for the indissoluble union of culture and morality. The sentiment that intelligence is the safeguard of republican institutions is as frequently false as true. The educated mind in conjunction with defective morals produces corruption socially and politically. Intelligence is a menace to free institutions unless it can be directed into righteous use. The most subtle foe to peace in America is the tendency to use power for selfish ends. The training of the child needs to include the teaching that honor and sacrifice are better social tests than place or property. Christian schools have emphasized this in all our national history. No doctrinal instruction is ever given in denominational schools. All denominations are singularly free from this habit. Perry Academy is established to meet the fundamental need of this section of Oklahoma for Christian education. It is not a money making institution and never will be for any of its founders. It is a character making scheme, and hopes to contribute to the nobler manhood and womanhood of Oklahoma. The Academy prepares for college, by three years of Latin, two years of Greek and mathematics, history and literature; for teaching by instruction in those branches needed for securing a first grade certificate; for business by teaching book-keeping according to the latest approved methods; for musical proficiency by thorough training in all that pertains to that art. The courses advertised are, Classical and Scientific, Normal, Business and Musical. Careful attention is given to the formation of studious habits. The Academy pretends to nothing more than that it does thorough, legitimate and honest work in the departments advertised. It presents an oppotunity for saving to the Oklahoma people the expense to finance, society and home patriotism always attendant upon sending young people away to school. N. S. Davis & Sons. This is the largest Livery and Feed Stable in the city, and they have the very best equipment of line driving teams and gcod vehicles. It is situated on E street and one block north of the square and has a frontage of 100 feet, including the wagon and feed yards. These gentlemen operate the stage line from Perry to Pawnee, and from Perry to Stillwater. This service is first-class and they have no complaint from the traveling public. Mr. Davis is a thorough horseman and gives the stock left in his charge the best treatment. He is courteous and accommodating with patrons which account largely for his successful business. 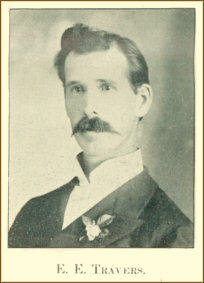 Mr. Davis is a native of Smith county, Virgina, and resided there until 1881, when he removed to Harrison county, Missouri. 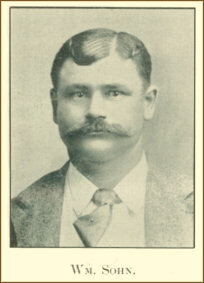 He resided in that county seven years, and then removed to Vernon county where he remained two years, coming- to Oklahoman, in 1891. He located at Stillwater and removed to Perry last January. E. K. Travers has recently purchased the photograph gallery opposite the postoffice of the Perry Portrait Co. and is prepared to take care of all work in that line in the best manner. Mt. Travers is known to our people as a practical artist of more than ordinary ability and many will be glad to learn that he is now permanently located in Perry in the photopraph business. Those needing anything in the line should patronize Mr. Travers. They will find that he will do them good work at the most reasonable price. At a fair estimate Noble county raised 500,000 bushels of wheat this year, and from the acreage sown last fall it is fair to place the yield next year at 800,000. Then there was 5,000 bales of cotton, 40,000 bushels of castor beans, say nothing about corn and oats.